Colorado Big Game hunting that will be sure to keep you coming back. We are fortunate enough to be located in some of Northwest Colorado's most beautiful and bountiful land. 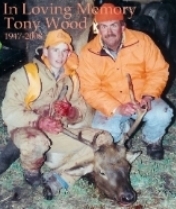 We are located just a short jaunt from Craig, CO and offer Deer, Elk, and Antelope hunts in areas 4 and 441. You can gather more information on these areas and the season dates and fees for licenses by going to http://wildlife.state.co.us/Hunting/ There is map information available there as well. At this time our hunts are with Gary Brannan. If you would like more information on booking a hunt and fees, contact Gary Brannan at 970-824-6768. Naturally being the shepherds of the herds we are constantly trying to keep a healthy balance between predator and prey and thus we also offer Bear, Mountain Lion and Coyote hunting opportunities. You can find season and fee information for those on the above link as well. Use our contact page and we will gladly get you more information on those harvesting opportunities.